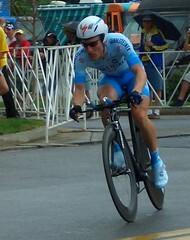 Gerolsteiner has named its final nine riders for the 2006 Tour, and named Levi Leipheimer and Georg Totschnig as captains, aiming for a podium spot in Paris. Gerolsteiner announced that they will send reserve Fabian Wegmann to the start line in place of Markus Zberg. Gerolsteiner was apparently confused about the Australian requirement, instead staffing the team with Austrians. I hope those blood tests can't tell the difference. The full Gerolsteiner squad: • René Haselbacher • Danilo Hondo • Peter Wrolich • Georg Totschnig • Sebastian Lang • Uwe Peschel • Ronny Scholz • Fabian Wegmann • Sven Montgomery RAGT Semences-MG Rover will be waving the French flag during time trial stages, as Eddy Seigneur held on to the French TT championship. This will be Seigneur's last Tour de France. The full squad: • Eddy Seigneur • Guillaume Auger • Pierre Bourquenoud • Gilles Bouvard • Sylvain Calzati • Frédéric Finot • Christophe Laurent • Ludovic Martin • Christophe Rinero I wouldn't be surprised if that's the last time you hear those names before the end of July, unless they put a rider in a suicide break. Finally, AG2R officially named Ireland's Mark Scanlon to their Tour squad, as noted at IrishCycling.com. Scanlon, the 1998 junior world champion, becomes the 1st Irish rider since 1987 Tour winner Stephen Roche rode his last Tour in 1993. He's the eighth Irish starter ever. Also on the squad: • Laurent Brochard (former world champ) • Jaan Kirsipuu • Jean Patrick Nazon • Stéphane Goubert • Nicolas Portal • Yuri Krivtsov • Mikel Astarloza • Samuel Dumoulin • Mark Scanlon This is a squad that could make some noise, with several chances at stage wins.